Blog / Get The Look / Steal This Cover Look! Steal This Cover Look! is a new monthly feature where we partner with one of our designers to show you how to steal our favorite interior design magazine cover look for $5,000 or less. This month, we loved the stylish beach-inspired forever-summer look of the Living Etc July cover and we immediately knew just the designer to ask. A San Francisco resident, Decorist Classic designer Christina Higham has a vibrant California style and a great knack for mixing textiles, patterns and textures - , her favorite place in the world is Kauai - which made her the perfect match for our cover challenge. I am loving this modern eclectic look featured on the cover of Living Etc this month – it effortlessly mixes midcentury with a more Manhattan Beach luxe elements to create that quintessential clean California vibe. Featuring the outdoors is the name of the game to draw up a little excitement in this space. Who doesn't absolutely love to feel like they are on a tropical island when sitting in their living room? 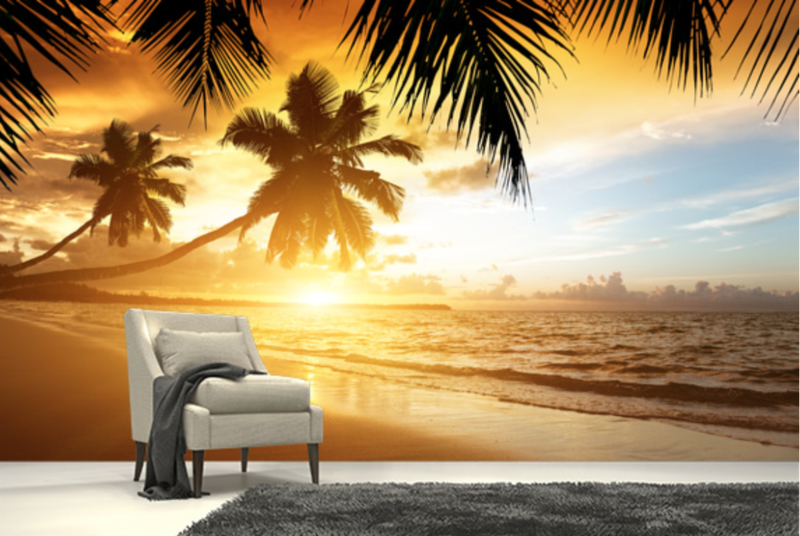 This oversize palm print wallpaper definitely transports you to another place! This cover does a great job of showing how a tailored color palette done right can provide a bold statement of refined sophistication. Eclectic does not always mean combine every pattern insight. Select a few color tones and go bold with a strong solid, like this fabulous deep teal area rug. The key to this cover is figuring out what items can be cheap and chic, and what items to spend a little more on. With a trendy and specific look like this, you don't want to go super low budget on everything, since you'd be able to tell the difference. The trick is to spend a little extra on the few items where you'd notice more and then balance it out with affordable finds. When designing budget friendly spaces, I always suggest investing in the sofa and armchair if possible - these are pieces that you will likely be using the most, so you will definitely notice the difference in quality and longevity. The use of color in this room is awesome - and very smart! 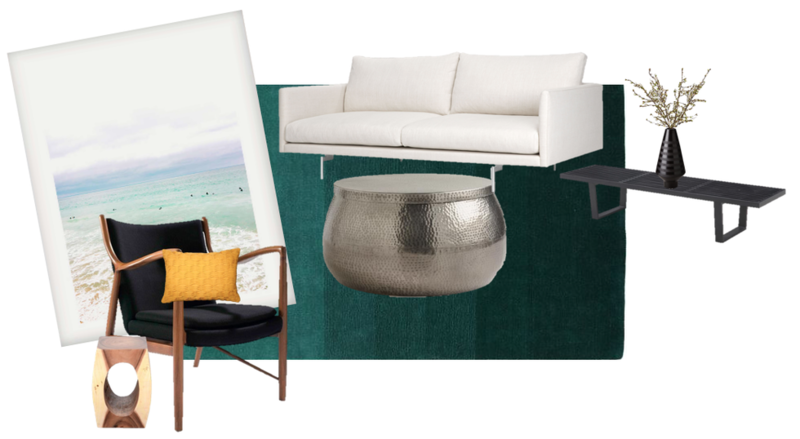 They grounded the space with a neutral sofa and chair (which could easily work in an entirely different room or design) while adding depth with color and metallics. Use the bold and bright colored items as trend-driven budget-friendly accessories to bring the theme to life - these are the items that would make the biggest impact when you decide to swap them out to refresh the look later on. I always refer to the color wheel when thinking about colors that will work together - cooler blue tones lie opposite from bright oranges and yellows, so they're sure to complement each other. For example, the teal rug looks great with the pop of yellow in the pillow. Keep this in mind to see if you can pull in any other pieces you already own from other rooms to add to this look. This look is all about the mix. Don't worry too much if every detail isn't exactly the same - focus instead on the overall shape, similar materials and the color. Not everyone has a free wall for a floor-to-ceiling beach photo mural, so to get a similar vibe, go with an awesome framed print... although, if you feel daring and want to go for the full effect, I also included a photo wallpaper option that would still keep you within budget! Have fun with this room! Love this look? Work with Christina to get a summer-inspired design or another modern-eclectic design for your own space. See more of Christina's design portfolio or start a project and request Christina Higham as your designer.